1. 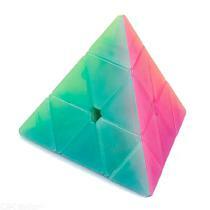 QiYi Qiming Pyramid Speed Cube is a shape mod that creates different shapes from ordinary cubes. It is an extra challenging because it is more than a layer of ordinary cube. Turn and twist the sides of the cube so that you return it back to its original cube-like color. Try a bigger challenge! Enjoy hours of fun with you family and friends. 2. Great corner cutting ,Tension adjustable.It doesn\\\’t corner twist as often nor does it lock up.Difficult to pop,good control of the cube, comes pre-lubricated and tensioned. Definitely a good choice for you to improve personal record in competitions.This cube can be used for international competitions. 3. For all ages,Speed Cube,to increase the intelligence of the kids,to release the working pressure of the adults,to help prevent a decline in memory of the elderly. 4. Combines high performance designs with good value.plastic color puzzle ,Crafted with original and eco-friendly ABS material, non-toxic, reliable, and lightweight and comfortable in the hand, harmless to human and environment. 5. Speedup your solving time without any effort and bring you the best turning feeling in advance. Easy turning and smooth play. 6. It is a classic colour-matching puzzle in which the colour shift making it look like a mess, but once you solve it, it magically becomes perfect cube again. Improved Anti-pop Technology and Structure for Extremely Fast and Smooth Cornering.